Float Controlled Valves (Cla-Val model 124-01) are widely used on break tanks in commercial buildings. Float valves operate on the same principle as the valves in the back of a toilet: a float attached to a rod moves up and down with the level of the water in the tank. Float valves are simple and effective, but there are drawbacks in commercial applications. Most valves are installed on the top of tanks with the float rod directly attached to the valve, making them difficult to access and maintain. Tank-water-level adjustments are also difficult because the float rod length and float position must be changed on the valve itself. When two float valves are used, there is no alternation between valves. The lead valve (shorter float rod) will always operate first, with the lag valve going long periods without use. This combination will eventually cause failures in both valves without proper preventative maintenance. Also, these systems typically provide little or no feedback to the Building Management System. 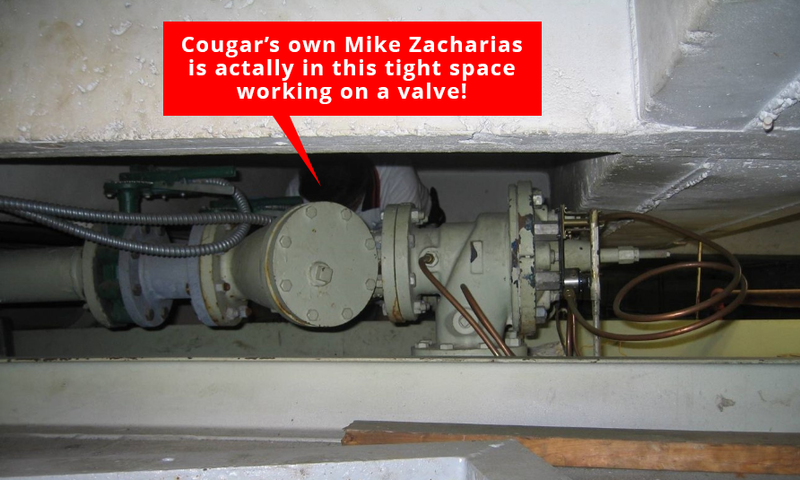 Cougar recommends using an Electronic Solenoid Actuated Fill Valve and a Level Control Panel to avoid all of these issues. The Cla-Val Model 136-01 fill valve uses the same base valve as the 124-01, but it uses an electric solenoid valve to open and close the valve rather than a float rod. This allows the fill station design to be improved in multiple ways. First, the valves no longer need to be installed on top of the tank and can be wall- or rack-mounted down at a level that is easy to reach. Instead of a float rod, a level sensor assembly is installed on the tank to provide level feedback to the control panel. The levels at which valves turn on and off, or levels for Low- and High-Level Alarms, can all be easily viewed and adjusted on the Control Panel Touchscreen Interface. Level adjustments require a few touches on the screen instead of a ladder and tools. The Level Control Panel also provides automatic alternation of multiple fill valves, thereby ensuring even wear. During each fill cycle, the lead fill valve alternates between valves; however, any valve can be manually run or taken out of service if required using the Open-Close-Auto Switch on the control panel. The Cougar Systems Level Control Panels have Tank Alarms and Level Outputs for the Building Management Systems to monitor. It is crucial that level-control systems be monitored for Low Level (loss of water) and High Level (tank overflow) alarms to prevent equipment failures and potential flooding. For more information on overflow and flood protection, see our blog post here. 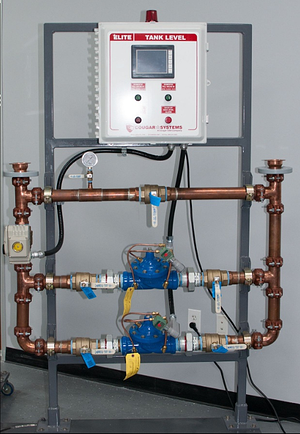 Electronic Fill Valves and Level Control Systems improve the operation of the fill station, will extend the life of the valves and provide building engineers with greater visibility of their system. For more information, please contact us.